As a special Front Row programme on Leonard Bernstein marks the centenary of his birth, we recount the fashionable soiree at the composer’s apartment in which the wealthy elite of 1970s New York mingled with members of the Black Panther Party. Here was the birth of 'radical chic'. On 14 January 1970, Leonard Bernstein, the famed New York Philharmonic conductor and West Side Story composer, hosted a gathering along with his wife Felicia in their apartment in Manhattan's Upper East Side. 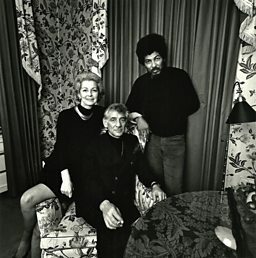 In attendance were some of the wealthiest movers and shakers of the New York arts world, including Otto Preminger, Sidney and Gail Lumet, and Barbara Walters, as well as several members of the Black Panther Party. The Black Panthers were an organisation fighting for equal rights for African-Americans, but whose radical socialist rhetoric was the cause of much concern for many Americans, and particularly the American government. FBI Director J Edgar Hoover called the Black Panther Party "the greatest threat to the internal security of the country" – for them to be invited to the home of an American celebrity was very strange indeed. The event was a fundraiser organised by Felicia Bernstein, already known as a prominent anti-war and civil rights activist. The party was intended to raise money in aid of the “Panther 21”, who were 21 Black Panther members in jail, charged with conspiring to kill police and various bomb plots around New York. They had been held without trial for nine months, with bail set so high it was effectively impossible for them to pay, and without resources to prepare for their defence. After an hour of socialising, the wealthy party guests were invited to listen to one of the Black Panther leaders, Field Marshall Donald Cox, list the Party’s manifesto and explain the situation the Panther 21 found themselves in. Then they solicited donations from the party guests, with funds going to help pay for legal fees and to support the families of the imprisoned Panthers. Members of the press were pointedly not invited to the Bernsteins' meeting, but two journalists managed to sneak in regardless and the next two days saw the New York Times reporting on this event as "group therapy plus fund-raising soirée" which "mocked the memory of Martin Luther King Jr". The Bernsteins and Don Cox vehemently objected to their intentions being portrayed as anything but genuine, with Felicia responding to the newspaper: "The frivolous way in which it was reported as a 'fashionable' event is unworthy of the Times, and offensive to all people who are committed to humanitarian principles of justice." The legacy of that night, rightly or wrongly, is that it led to writer Tom Wolfe coining the phrase Radical Chic as the title of his satirical New York Magazine article, lampooning the way the liberal elite found it fashionable and fun to take an interest in the social issues of the day. It was within this article that the above image was originally printed. Wolfe was the one who called the photographer Stephen Salmieri to the party. Salmieri recounts that Wolfe phoned him from the Bernsteins' bedroom, telling him to come with his camera, and 20 minutes later he was there. Salmieri remembers arriving at the door ready to shoot with his umbrella light on and ready to go. Felicia Bernstein answered the door and upon announcing that he was the photographer she welcomed him warmly, offering him a drink, despite his lack of an official invitation. Within 30 seconds of arriving Salmieri took his first image in the Bernsteins' hallway, which just happened to be the image of the night - capturing the Bernsteins with Don Cox. He recalls a smoke-filled room with a relaxed and unselfconscious atmosphere where the Bernsteins and Don Cox seemed like old friends happily discussing what a great breakthrough the event was whilst also planning for their next event. Salmieri put his success down to the fact that: "I learnt not to look like a news photographer but an event photographer." The Panther 21 were eventually acquitted of all charges in May 1971. The frivolous way in which it was reported as a 'fashionable' event is unworthy of the Times, and offensive to all people who are committed to humanitarian principles of justice. I learnt not to look like a news photographer but an event photographer. The animated characters who watch other shows on TV. Can your favourite audio survive a move to the screen? Seven times the art world grappled with wrestling. Seven doomed futures from E3’s hottest games. An offbeat take on the legendary shops of TV comedies. How Sam Henry saved the people's music. 9 videos showing amazing moments from #DancePassion.